This case study will describe the method on how to create, animate and interact with virtual humans in the context of cultural heritage. Our contribution to these several projects was to show the state of the art of virtual humans and in-teractive applications. We will focus on the interaction loop between the detection of visitors and the reacted expression of the avatar, the dynamic and the integra-tion of metadata such as pictures, storytelling, information that enriched the user experience through an exhibition presented at the biggest museum of computer science in the world: Lady Ada. 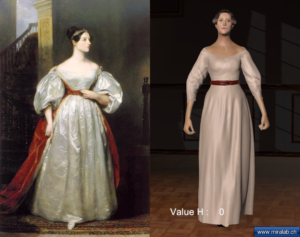 cultural heritage, digital documentation, 3d reconstruction, se-mantic annotation, virtual humans, animation, clothes. The restitution of an intangible scene is basically composed in two different tasks: Reconstructing the tangible heritage of the cultural site and proposing a restitution of the intangible cultural heritage. 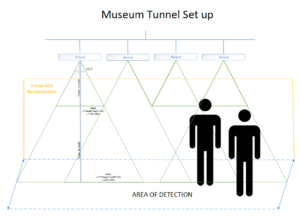 See  and  for a survey of the possible way to present a general classification of the different approaches that might be employed to constitute a visual representation of cultural heritage. A lot of previous work has already been done in the domain of virtual tangible heritage reconstruction, see ,  and . In this specific area, different points are critical: the digitization and processing of the environment, the preparation of the lighting model and the modelling of the textures. In order to reach an immersive cultural VR or AR application including intangible content, the critical aspects are the modelling and animation of the virtual character. Indeed, the restitution of scenes involves virtual characters  and . 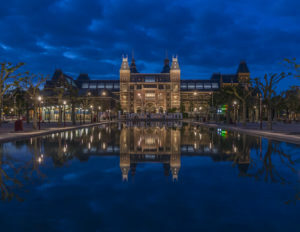 The last 2 decades, a lot of work has been done in the domain of virtual museum. Tangible and intangible restitution in virtual museums has to be historically precise, pedagogic and well designed. The additional difficulty is to provide an efficient application that satisfy the user’s expectations. In this chapter we present the different method around interactive behavior for virtual humans. 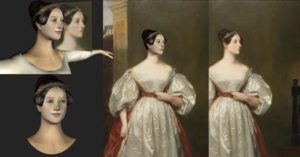 We illustrate technics based on our work for the special Lady Ada Byron’s exhibition at the Nixdorf Museum in Germany (see figure 22 and ). 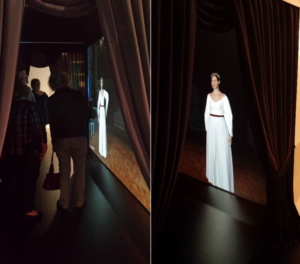 A virtually modelled Lady Ada was projected onto a big wall screen inside a tunnel. She could react to the presence of people and talk to them, explaining historical clues related to her story. We will present first the tracking development that allow to feel the visitor, and then how this information is integrated to a global behavior system that give constituency to the virtual human and embed all necessary components. To give senses to our VH we need to get a stream of information about the behavior of the passing people. Usually this means the use of sensors that can extract various information from the visitors, along the time and with a sufficient accuracy. In our case study we needed the position of the people at least 15fps. This was made possible by the use of multiple sensors and tracking technology. The device Kinect V1  (Microsoft Xbox One), which was originally developed for home entertainment purposes, but has also gained popularity in the scientific community [10 and 11]. The Kinect is an Infrared depth scanner and HD camera (720p), composed of an infrared (IR) projector, an infrared camera and an RGB camera. We set up 4 Kinect for Windows v1 side by side, such that the area covered by each Kinect is along the other one. All connected to a computer that will process the information and output on a video projector. Schematics of the sensors set-up. On top are the four Kinects that detect people in a contiguous circular area. The incoming data acquired is four images of depth at a variable rate. We then have a buffer that waits to receive four images to then merge them into one to avoid missing images. We extract blobs based on the depth information. We decided to use a depth corresponding to a range of 40cm, between 1.50 and 1.90m above the ground to be able to detect most people. An additional function gives us the position of the center of this detected blob over time. Another memory function ensures we know the position of the same person over time without misleading the person. The output is an array of person position over time, so their trajectory. This two information is produced at a different frequency and will be integrated into the virtual human behavior by replacing values when these values are changing. Therefore the behavior loop is time-independent of the tracking unit. 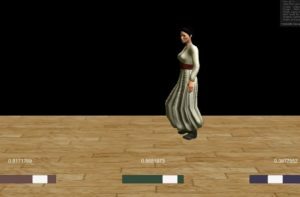 The locomotion, gestures, speech, and reaction of the avatar are driven by a behavior management unit that guarantees the constituency and synchronization of the virtual human visual behavior. In the case of human-machine interaction for entertainment purposes, the people are expecting a fast and reliable feedback of the interaction device, which is, in this case, the virtual human, as suggested in ,  and . The synchronization between the different possible actions of the virtual human and huge reliability is essential for his credibility. Such objectives can be achieved using behavior trees. 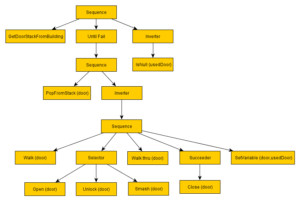 Behavior tree is a programming technic that allows management of errors and is well suited for real-time application. It is made of hierarchical states that can be an action, animation or modification of variable. The behavior made in our case is oriented interaction: The VH passes from idle states where he is doing nothing or static actions to interaction mode where he is approaching the screen as the people are coming and wave at them before talking. Having the virtual human looking at you even if you are moving is a common feature that is very important for credibility. We use the position tracking and projected that into a plane so that every person in front of virtual Ada will feel that she is looking toward them. An adjustment in depth is also necessary to avoid looking above people or in case of children. Virtual Ada face close-up. The eyes follow the spectator motion. Using the spatial motion embedded in the animation, if it is a long clip. It means we don’t have precise control every second but roughly every 10s. First, move the virtual human in translation and/or rotation in the same time as the animation is playing. These two has to be synchronized to avoid sliding effect. Using so called root motion. This allows the translation to be determined by the animation, which make more sense and much more easy to use, because no tuning is required. However in that case the driving of the animation by the pathfinding side should be well thought. For virtual Ada, we defined six main spots that she is moving toward. The locomotion behavior consist then in moving to front spots when people are present, and going to back spot when nobody is there (figure 27). The gaze motion take control of the joints around the head and overlay other animation such as lip syncing for talks, allowing constituent multiple animation at a time (for example talking and moving the head toward someone). Using the studies from , we integrate an emotion recognition system based on body movement analysis. This allows the avatar to be aware of the emotion expressed by the people trying to interact with him. It will be then used during the avatar’s talk to better communicate with the user. The emotion recognition system is based on an emotion model from one hand and a motion model on the other hand. A complete motion analysis is made in real time and then processed using statistical analysis. 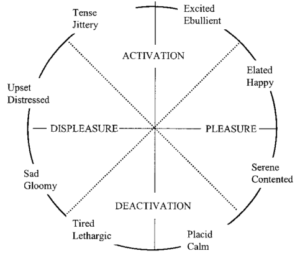 The output is an estimation of each people’s emotion regarding Russel’s classification. The motion of the virtual Ada will be influenced by the recognized emotion. Lots of adjustment has to be done on-site as the timing of the virtual human behavior needs to be tuned when testing in real condition with behavior of multiple people. The real time analysis and synthesis can be tricky and could go fastly to some bugs or blocked states. This is why the program has to be bug-resistant and running even if some part of it is stuck. The result of the Ada exhibition (figure 29) is an interactive virtual human that react in function of the visitor motion inside a specific area. Position tracking, emotion recognition, and behavior analysis are been used to determine a precise state of the people. Bringing life in a cultural context means to take into account a lot of information and constraints. Modelling a full human with his accessories and his clothes is already a challenge. We need then to model the environment and integrate the Human inside the environment. Then the motion correlated with gesture and interaction has to be brought. Many decision has to be made at different level that have consequences. The choice depend on what is the objective: what we want to show and what is the material at disposition. Depending on the way we want to interact (Kinect, position sensor, gesture sensor, distance, speech recognition) we can organize a different virtual human behavior. We showed through our examples corresponding to multiples European and side project that each case study will drive the development of the final application or research. For cultural heritage, the different resources to digitize can be complex and needs careful attention. Furthermore, the interactivity should follow the educational objectives as for a specific use . The new technics and devices allows now more virtual and augmented reality tours that can enhance the user’s experience. Marlène Arévalo, Nedjma Cadi-Yazli, Nadia Magnenat Thalmann. Progress in Cultural Heritage. Documentation, Preservation, and Protection 5th International Conference, EuroMed 2014, Limassol, Cyprus, November 3-8, 2014, Proceedings. Foni, A. E., Papagiannakis, G., Cadi-Yazli, N., & Magnenat-Thalmann, N. (2007). Time-Dependent Illumination and Animation of Virtual Hagia-Sophia. International Journal of Architectural Computing, 5(2), 283-301. Magnenat-Thalmann, N., Foni, A. E., Papagiannakis, G., & Cadi-Yazli, N. (2007). Real Time Animation and Illumination in Ancient Roman Sites. IJVR, 6(1), 11-24. Papagiannakis, G., & Magnenat-Thalmann, N. (2007). Mobile augmented heritage: Enabling human life in ancient pompeii. International Journal of Architectural Computing, 5(2), 396-415. Egges, A., Papagiannakis, G., & Magnenat-Thalmann, N. (2007). Presence and interaction in mixed reality environments. The Visual Computer, 23(5), 317-333. Apostolakis, K. C., Alexiadis, D. S., Daras, P., Monaghan, D., O'Connor, N. E., Prestele, B. & Moussa, M. B. (2013, July). Blending real with virtual in 3DLife. In 2013 14th International Workshop on Image Analysis for Multimedia Interactive Services (WIAMIS) (pp. 1-4). IEEE. Kitsikidis, A., Dimitropoulos, K., Douka, S., & Grammalidis, N. (2014). Dance Analysis using Multiple Kinect Sensors. VISAPP2014, Lisbon, Portugal, 789–795. Mao, Q.-R., Pan, X.-Y., Zhan, Y.-Z., & Shen, X.-J. (2015). Using Kinect for real-time emotion recognition via facial expressions *. Front Inform Technol Electron Eng, 16(4), 272–282. Moussa, M. B., & Magnenat‐Thalmann, N. (2013). Toward socially responsible agents: integrating attachment and learning in emotional decision‐making. Computer Animation and Virtual Worlds, 24(3-4), 327-334. Gutiérrez, M., García-Rojas, A., Thalmann, D., Vexo, F., Moccozet, L., Magnenat-Thalmann, N. & Spagnuolo, M. (2007). An ontology of virtual humans. The Visual Computer, 23(3), 207-218. Kasap, Z., & Magnenat-Thalmann, N. (2007). Intelligent virtual humans with autonomy and personality: State-of-the-art. Intelligent Decision Technologies, 1(1, 2), 3-15. Simon, S., Cuel, L., Aristidou, A., & Magnenat-Thalmann, N. (2016). Continuous body emotion recognition system during theater performances. Conference of Animation and Social Agents, CASA. O'Connor, N. E., Tisserand, Y., Chatzitofis, A., Destelle, F., Goenetxea, J., Unzueta, L. & Thalmann, N. M. (2014, September). Interactive games for preservation and promotion of sporting movements. In 2014 22nd European Signal Processing Conference (EUSIPCO) (pp. 351-355). IEEE.